[CONT](RC):During the battle that it boosted, this unit gets [Power]+3000. 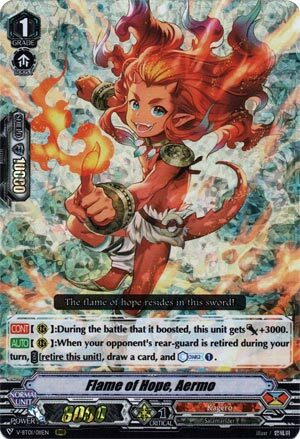 [AUTO](RC):When your opponent’s rear-guard is retired during your turn, COST [retire this unit], draw a card, and Counter Charge (1). Countercharge that’s a +0 wash? Makes numbers with a 12k+ attacker (so Berserk or any G3)? Sorry, why aren’t you running this at 4? Apart from that fact it doesn’t feed soul but that’s asking a bit much for what this does.